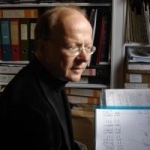 Robert Orledge became Professor of Music at Liverpool University in 1991, specialising as a historical musicologist in the way composers composed, and publishing numerous books and articles on Fauré, Debussy, Koechlin and Satie. Since taking early retirement in 2004, he has become a ‘creative musicologist’, concentrating on completing and orchestrating Debussy’s unfinished works. His completion of The Fall of the House of Usher was successfully premiered at the Bregenz Opera Festival in 2006, alongside the Chinese ballet No-ja-li in Los Angeles. His Nocturne pour violon et orchestre was broadcast from the Amsterdam Concertgebouw in November 2011 with Isabelle Faust as soloist and Heinz Holliger conducting, and his most recent completion is Le Diable dans le beffroi. His volume of Debussy's orchestrations is due to be published in the Durand Oeuvres completes (V/11) later this year.